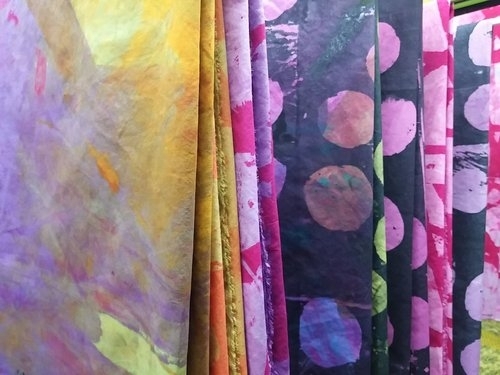 Classes > CLASS LIST > Dyeing & Surface Design > On Your Mark - Print! On Your Mark - Print! Take a favorite mark and use that motif in various print methods from direct dying and dye painting to layering print techniques wet and dry. We’ll create variety of fabrics that relate, contrast, and become the center of attention in a piece. Starting with a notebook of linear designs and shapes, we’ll center on how to use a mark and define that motif simply and dramatically. Experiment with underlaying color for a background, applying a printed texture to the fabric, and adding a graphic element through the use of silkscreen, monoprint, and stencils. Using thickened dye as our medium, we’ll add color and pattern, repetition and scale to design a fabric that will result in cloth that has layers of images, bold, beautiful, and one-of-a-kind. This class will leave you with a notebook of real experiences that use the surface design printing tools, and you’ll know well how to Make Your Mark!